Sometimes, when we watch Billie Burke on screen, we feel a little envious at her ability to portray blithe characters who skate across life, leaving barely a scratch. These are not people who burden themselves with the Deep Questions Of Life. They take life as it comes, refusing to get sucked into its undertow. Fortunately for us, scriptwriters usually endow these characters with very witty dialogue. Hi Diddle Diddle, like the nursery rhyme of a similar name, is a movie that does what it wants and doesn’t seem to care what you think. It’s a comedy that operates under its own set of rules, made by independent filmmaker Andrew L. Stone, who didn’t have a major studio meddling in things. The tone is set in the opening title card: “[This] is a picture with a purpose… Try to find it.” Stone is winking at us; he knows he’s whipped up a frothy confection and he ain’t going to to pretend otherwise. We respect that in a picture. Billie Burke is a perfect fit in this madcap film. Her warble-y dialogue is a treat, a wonderful contrast to the other characters. 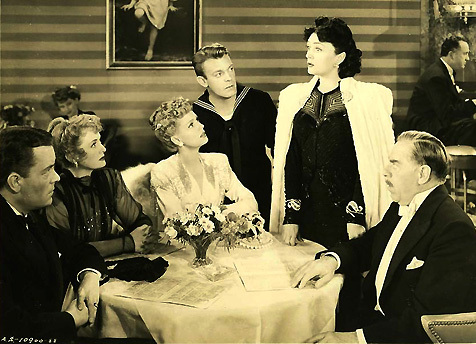 The cast includes Adolphe Menjou as the naval fiancé’s father, a gruff man with dodgy business practices. Pola Negri is Menjou’s new wife, an over-the-top-but-endearing opera singer who wonders about Menjou’s extra-curricular activities. Burke: Will she recover her swindled fortune? Menjou: Will his scam prove to be a money-maker? Negri: Does she believe Menjou is having a dalliance with a nightclub singer? Scott: Will she discover her naval fiancée is not, in fact, on a secret government mission? See what we mean? All of this in 73 minutes. The mind reels! Still, there could have been a wee bit more room made in the script for the talented Burke who made a career out of playing fluffy, rich women. Burke was married to Florenz Ziegfeld, who died in 1932 and left her deeply in debt. Even though she loved the stage, Burke worked in film to pay off Zeigfeld’s debts, and even received an Oscar nomination for 1938’s Merrily We Live. Her impressive filmography includes Dinner at Eight, The Wizard of Oz, Topper and, of course, our movie today. We’ve been wondering why Hi Diddle Diddle isn’t more well known. Perhaps the title makes people gag – but don’t let that put you off. We think you’ll like this unconventional screwball comedy featuring the gifted Billie Burke. Hi Diddle Diddle: starring Adolphe Menjou, Martha Scott, Pola Negri. Directed by Andrew L. Stone. Screenplay by Frederick Jackson. United Artists Corp., B&W, 1943, 73 mins. Billie Burke always makes me laugh, but I can see why she could come across as irritating. I had NO idea what to expect when I started watching this movie, but now it’s become one of my faves. I’ve never seen (or heard) of this film before, but you make it sound like a pleasant way to spend an evening. I have always enjoyed the Burke movies I have seen, for all the reasons you have mentioned. I look forward to adding this one to my watch list; despite the title. Thanks again. Ha ha – yes, the title is a bit off-putting and, frankly, this kind of sacchrine does disservice to the film. But if you can get past it, you’re in for a real treat. Ruth, you make HI DIDDLE DIDDLE sound delightful! You had me at “[This] is a picture with a purpose… Try to find it. }”And let’s face it, it’s not every day that you see a 1940s film that co-stars both Billie Burke (who we love for both WIZARD OF OZ and THE MAN WHO CAME TO DINNER) AND silent film star Pola Negri. I’ll keep an eye out for it, pal! I like both Billie Burke and Adolphe Menjou, so would be interested to see this… it sounds as if the film is a lot better than the title! Menjou is a treat, as always. He’s another one who always makes us laugh with his gruff-yet-endearing demeanour. Sounds like another one to put on my list. Thanks to you, Ruth for showing me so many new (to me) movies to watch. I appreciate it! I’m so glad you have an enthusiasm for these films. They deserve to be seen again by today’s audiences. Aww, thanks for your kind words. Billie Burke always makes me smile – I get excited when she appears in a film. In a weird way, she helps me put life in perspective, i.e. to not take things so seriously. I admire that she could play such funny, frivolous characters after losing her husband and facing an enormous mountain of debt. I never seen “Gilmore Girls” – not even 5 minutes, if you can believe. But if a character wanted to grow an Adolphe Menjou mustache, then I think that is my kind of show. Where did you find this? Is that young Dennis O’Keefe I spy in uniform. I love young Dennis O’Keefe (and older O’Keefe for that matter). Miss Burke perfected the not-all-there character and is always a pleasure to watch. The “not-all-there character” is a brilliant description of Burke’s best performances. Good eye! That is indeed a young Dennis O’Keefe. Thank you very much for your kind comments, and for stopping by. Billie Burke, in my mind, is criminally underrated. Burke is brilliant in MERRILY WE LIVE. It’s one of the funniest films that no one seems to know about. I haven’t seen it either, but have just bookmarked it on YouTube. Thanks!